is a new, fun, group activity featuring drills to give players of all abilities an ultimate, high-energy workout. Includes warm-up, cardio workout, and cool down phases resulting in Heart Pumping fitness. Get in shape and burn calories. Fun, fast, and fit. 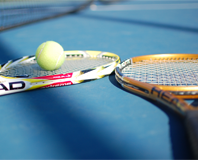 Cardio Tennis can help you stay fit for life!